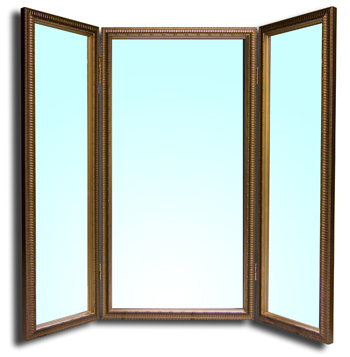 Custom Mirrors that can be individually framed add a sense of class to any room. Provide FRAMECO with a look and size that is needed. Samples of frames will be provided to select from and if needed, a personal visit, if local, to determine the exact size for the space. All mirrors can be with or without a bevel. This custom designed vanity mirror was built for a client that wanted a freestanding mirror with adjustable sides.